Today we will talk about rook endgames. Even if MOST endgames are rook endgames, a majority of players make lots of mistakes in these situations. That’s why we took a typical position that can help you in your future games (when you’ll meet similar positions). In the example we will show you, it is a rook endgame played by the famous French champion Etienne Bacrot and the Russian Grand Master Pavel Tregubov. Bacrot with White and 100 points ELO over his opponent seems to be the favourite, but rook endgames are always very difficult, as you’ll see in this lesson. Take few minutes and think about this position. Rook endgames tend to be drawish pretty often. But you’ll see that, in practice, this is not easy at all. - What is Black’s plan to play for a win? - How should White defend? After that, please click the LINK to observe the actual game with comments. If you wish to improve your endgame skills, you should study PRACTICAL examples. Endgame books, unfortunately, are filled with theoretical positions that may never happen in YOUR games. Another important thing is to know the typical endgame PLANS. You are probably well versed in some middle game plans (attack on the kingside/king, pawn minority attack, etc.) but what about an endgame? One of my friends (he’s a Russian GM) told me: “Once we reach an equal endgame, they all offer me a draw. And after I reject it, they do not know what to do”. Sadly, this is true of most intermediate players. If you want to overcome them, you may study the course “An Endgame Expert”. This single course will bring you to the ADVANCED level in endgames. 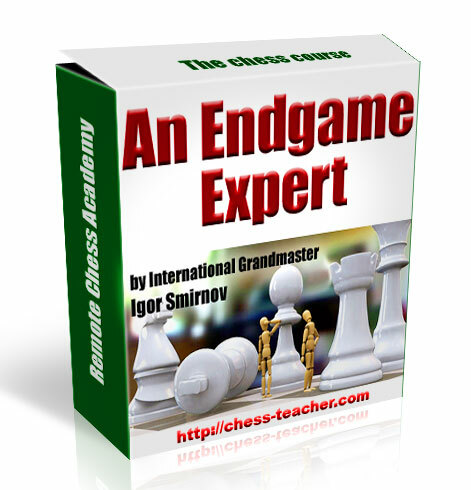 Click here to get ENDGAME EXPERT chess course!